NLM needs your input. We are experimenting with a new PubMed search algorithm, as well as a modern, mobile-first user interface, and want to know what you think. You can try out these experimental elements at PubMed Labs, a website we created for the very purpose of giving potential new PubMed features a test drive and gathering user opinions. Please note that PubMed Labs includes only a limited set of features at this time and not the full set of PubMed tools. The absence of a feature or tool on PubMed Labs does not mean we plan to eliminate it from PubMed; it simply means we are not testing it now! Based on analysis of data obtained from anonymous PubMed search logs, we have developed a new algorithm that we believe does a much better job of sorting search results by their relevance, or “best match,” to your query. This new algorithm incorporates machine learning to re-rank the top articles returned. We were so excited by results with this algorithm that we already implemented it in PubMed, but it is still experimental and we would very much appreciate hearing what you think. Part of our test in PubMed Labs is having best match be the default sort, instead of PubMed’s default of sorting by most recent articles. If you find that you prefer to sort by the most recent articles instead, it takes only a simple click of a button to do so. Interested in specifics about the new algorithm? You can read more in this NLM Technical Bulletin. Glycobiology—the study of the structure, biosynthesis, biology, and evolution of glycans (the sugar chains synthesized by all living cells)—is a rapidly growing field in the natural sciences, with broad relevance to many areas of basic research, biomedicine, and biotechnology. NCBI has two new glycobiology resources: the third edition of a definitive work in the field, Essentials of Glycobiology, and a new NCBI Glycans website that includes links to some useful external resources as well as the Symbol Nomenclature for Glycans (SNFG). This blog post is intended for people who refer to chemical names/symbols and synonyms in databases like PubMed and PubChem, or in their own scientific papers. There is a similar post for gene symbols and names. During the research and publishing process, scientists need to refer to their chemicals-of-interest. While there are standardized nomenclatures (IUPAC, SMILES, InChITM, etc. ), different labs sometimes use different names for the same chemical. The NCBI PubChem project has set up a system to identify and correlate these various names as well as ‘alias’, ‘synonym’, or ‘also known as’ terms that have been used in the literature. The University of Oklahoma Health Sciences Center has published an open-access book called “Streptococcus pyogenes: Basic Biology to Clinical Manifestations” that provides a comprehensive review of research on the bacteria. The university’s first online, open-access book, “Streptococcus pyogenes” is freely available on NCBI’s Bookshelf, at http://www.ncbi.nlm.nih.gov/books/NBK333424/. You’ve seen it before on shopping web site: you load a page displaying an item you want and see a list of other items that people bought with the one you’re viewing. PubMed is free, but finding the important articles on a topic can cost a lot of time. To help you keep on top of the literature – with a little help from your fellow PubMed users – we are introducing a new type of link called “Articles frequently viewed together”. For some PubMed abstracts, you may see this link in the “Related Information” section in the right column. Figure 1. The PubMed Also-Viewed feature. 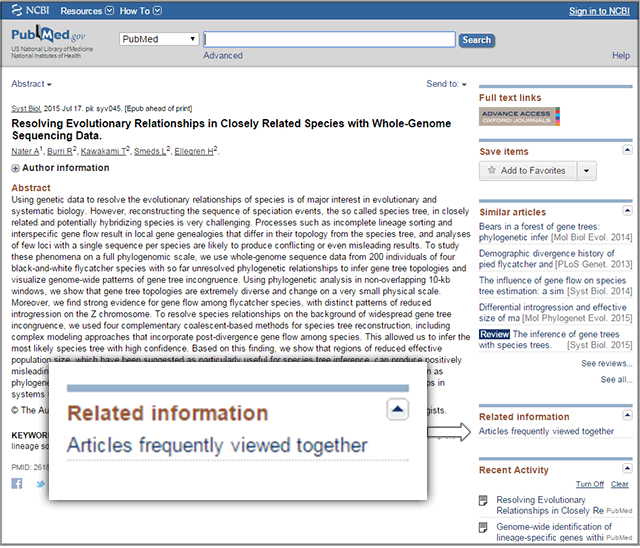 Do you regularly perform PubMed searches to find new articles on your topic of interest? Would you like to know when new sequence records become available for your gene? Is it important to be alerted when new bioactivity assays are available with inhibitor data for your enzyme? With a free My NCBI account, you can easily set up a series of e-mail alerts to notify you of such new information. You can read more about the many other functions of My NCBI. My Bibliography is a component of the My NCBI service and allows authors to create an online collection of their published work. While editing their bibliographies, authors can import citations for their articles directly from PubMed, and the system will automatically check for duplicates and will remove citations imported more than once. However, authors may still end up with duplicates in certain situations, and sometimes it is not obvious how to remove these duplicates. In this post we will describe three situations where duplicates may persist and will discuss ways to remove them.